A group of art students at the College of Coastal Georgia just gave residents of GraceMore Nursing and Rehabilitation Center a very special Easter present. But to understand this Easter surprise, one has to look back to the days leading up to Christmas. Nichole Moore, the social services director at GraceMore nursing home on Altama Ave. in Brunswick, called the College in December to ask if students would be interested in doing a special project for the nursing home. The residents of the home have church services in their main activity room each week, but, she said, the space wasn't particularly inspiring or sacred. She had recently saved two large pieces of cardboard, about 48 by 72 inches, and thought an enterprising art student could make something out of it. Professor Jeff LeMieux brought the project to Lauren Holman, President of the Art Club, who approved of the idea. After some internet research, basic sketches for two faux-stained-glass windows were developed. Art Club advisor Dr. Aurora Pope, worked with Art Club members Carmen Garcia, Lauren Holman, and Jacob Billings to create an initial cross mural, which was a warmup for the more complex angel mural (both pictured below). "I'm proud of our students for taking on this challenge and impressed by the incredible pieces they created," said LeMieux. "Apart from their obvious artistic talent, I believe their paintings convey an abundant generosity of spirit." The works were presented to a delighted Moore at GraceMore on Thursday, March 29 and adorned the activity room for an Easter Service this past weekend. 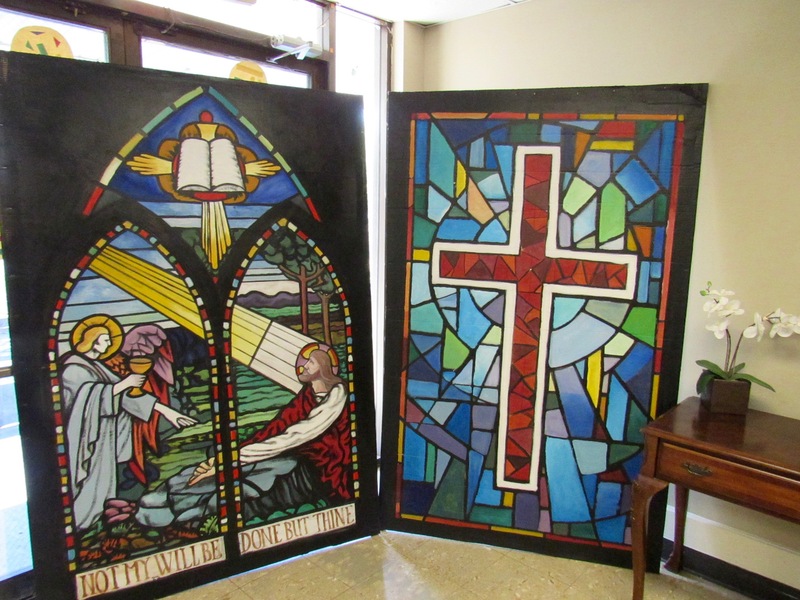 "The talented young men and women who created these beautiful art pieces have given our residents a gift that will last well beyond Easter Sunday. I'm truly grateful," said Moore.